This farmhouse-style utensil canister is upcyled from a glass peanut butter jar. The full instructions are here. Re-purposed food boxes and pudding cups helped create this pretty baking supply drawer from I Heart Organizing. Organize your kitchen pantry with coffee creamer bottles. Get the details here. Cans with pretty labels can be used as-is for kitchen tool storage. Old shuttered doors can bring a little extra vertical storage to a kitchen. Plastic soda bottles get a second life as storage for small hardware in the garage. Old muffin tins also work well for hardware storage. Empty detergent bottles are another source of free garage storage. Turned on its side, an old metal filing cabinet works well for storing large yard tools. Add casters to old wooden drawers for under-bed storage. Paint and pretty handles can help tie them into your room decor. Extra ice cube trays can help you organize a large makeup collection. They also work for jewelry, or office supplies. This clever jewelry organizer is made from a plastic plant nursery tray. Get the details here. Instead of throwing out old candle containers when the wax is gone, re-purpose them as apothecary jars. More here. Give old teacups and bowls a new use as drawer organizers for jewelry. An unused spice rack works perfectly for storing a nail polish collection. Cardboard mailing tubes or large plastic pipes make excellent drawer organizers. Cover them with paint, patterned paper, fabric, or contact paper. There are a million different ways to turn cardboard boxes into attractive storage. This one uses contact paper and knobs. Instructions here. This version from Living Well Mom uses sisal rope and fabric to create the look of a basket. Cardboard shoe boxes get transformed into faux vintage luggage with the help of a little paint and these instructions from Pillar Box Blue. I wasn't sure what rooms to assign these stackable storage bins make from plastic water jugs, because you could use them practically anywhere. Details on how to make them are here. This shoe organizer made from cardboard is space-saving, and extremely economical. Paint the cardboard or cover it with contact paper for a more refined look. Instructions for how to make your own are at A Piece of Rainbow. Organize your office supply drawers with tuna cans. Egg cartons are another free drawer organizer.If yours isn't a color you like, you can always paint it. Give an old crib railing a new life by converting it into a magazine or blanket rack. An old shutter works well for organizing mail and paperwork. Organize drawers with dividers made from cereal boxes. These could be useful in the bedroom and kitchen, too. Get the full instructions here. This version is made from tea canisters, but you could use any tubular food containers, cans, jars, or mailing tubes to make pen and pencil storage. Add paint or nice paper to spruce it up. Re-purpose an old plastic wrap or aluminum foil dispenser into washi tape storage. Get the how-to here. Use all of that washi tape you just organized to decorate these magazine holders made from cereal boxes. Follow the instructions here. Give an old cassette tape holder a new life as upcycled organization for ribbon. I'm itching to try some of these ideas in my own spaces. Did anything catch your eye for future organization projects? On the hunt for more upcycled organization tips? 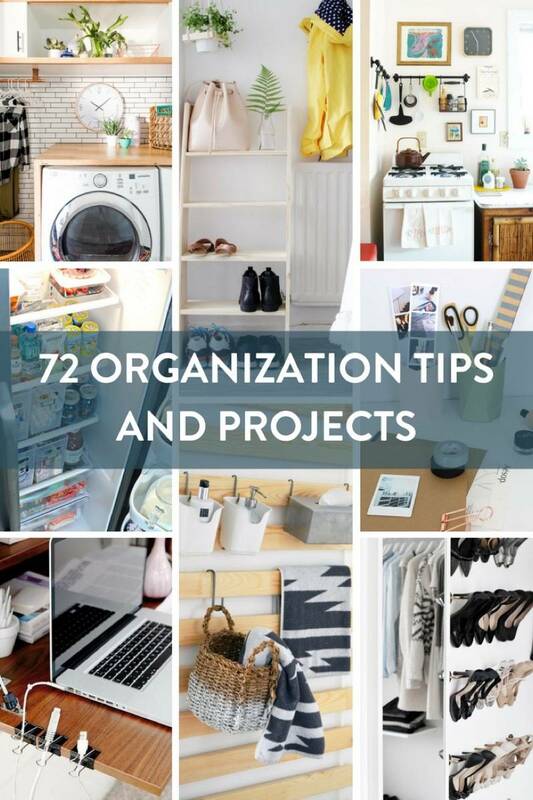 Check out our ultimate collection of organization tips and tricks.